Here he is... finished. Keep in mind he has been painted as a project for a Client and not specifically for the Golden Bolter contest. You can click on either one of the pics to see the larger version. I'll be doing a quick step by step on how I painted his metal armour since I received a request for it. If there are any other questions, I'll do my best to answer them or post a step by step to explain what I've done. I still have to cut out the left and right views, but I figured I post these so you guys could give me some honest feedback on the model. Granted I can't go making any sweeping changes at this point, but I'll gladly take advice for the next time I get to work on something like this. On a scale of 1 to 10, this is about a 6 or 6.5 for me. I'm trying to guage the amount of work and time it might take to get an actual Golden Daemon entry completed. Great work mate! 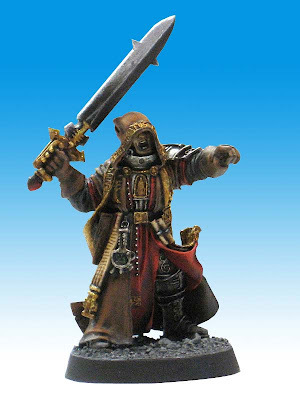 I like the lower portion of the cape - the dark dirt covering the colour of the robes is a very strong point. Very nice! I really like the replacement blade, I have a Solomon Lok miniature and in all honesty I think the sword you made looks superior to the 'real' one. The Inquisition symbol on the back of the coat is a nice touch, I may have to go back and add something similar to mine. The only thing that I would suggest would be that I feel the interior lining of the coat could stand to be a significantly lighter shade of tan or a totally different contrasting color (white or grey), which might make the one visible armored leg 'pop' a bit more, but that may make the model too busy. All in all, top notch work! I concur with Mordian in that it needs more color. As it stands, it's basically just shades of browns and metallics (half of which blend into the browns)--it lacks a color to make it pop. Granted, I'm sure this was your intent with the red, but somehow, it just doesn't work for me. Of course, the model is splendidly painted though. I would've preferred to see a more vibrant palette though (keep in mind this is from the guy that hates metallics, and paints his Ultras in almost purely primary colors). Hopefully you don't take this post as an insult--as it wasn't intended that way... merely as constructive criticism. Impressive as always. Hey ron Nice work you got there mate! blending on the red cloth is suburb (is that the right word?) the leather looks good and your free hand is stunning to say the least. Some points of criticism: some of the gold is great but some little details bug me. Like in the bottom picture you see the back of the golden scarf where it kinda connects with the leather coat. It looks undetailed and a bit like a golden blob. some more work to increase the depth and detail ther would be a great increase. last thing is the shoulder pad it looks to light in comparison to the rest of the model I feel it could have used a more extreme colour as shaded side which would make it feel little darker and give more depth at the same time. Hope you can take these points of criticism with a pinch of salt since we are off course only looking at pictures. But a great model non the less! I just wrote a big old comment and then navigated away and lost it. Let me explain, no there is too much, let me sum up. I think composition would do a huge amount for the model. My eyes get drawn to the tip of the sword or the red tabard/sash thingie. When my eyes get drawn to the sword tip, I lose interest as the next thing I see as work along the model is more sword (nice shading and glint on the blade by the way). I follow the sword down to the hilt, which is well down and has a lot to look at, but by the time I have looked at it my attention span is starting to wane, and from the hilt back to the body of the model is barren. When I start with the red, my eyes follow the tabard down following the flow of the robes, rather than being drawn up towards the face and reliquary in his armor. this leaves me looking at a dark and shadow part of the model and I stop looking. I think spending more time on composition (which I know you know how to do) would make a huge difference. If you look at the last 4 years of Golden Daemon/show piece quality stuff, either is superior one dimensional gimmicks ( silly amounts of free hand, monochromatic palettes, interesting lighting effects, reverse image painting) OR well composed models. The gimmicks come and go (I am glad the free hand era is over), but well composed models always are in the running. It's a beautifully painted model. BUT I have to agree with the others that it needs a bit more color somewhere. The shoulder guard comes to mind -- something to bring out the iconography, etc. 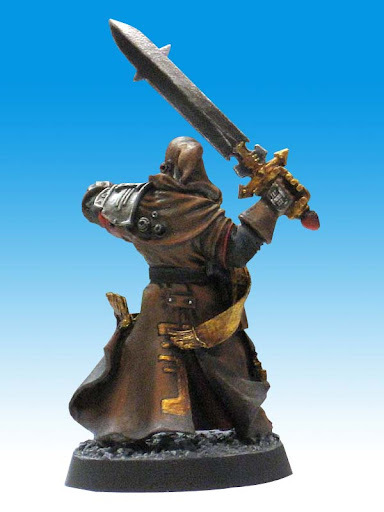 It's a great looking model, and personally I like the consistently dark color scheme on him. I think the red and gold are sufficient to give the model some color without being garish. The face is also very well done. The only criticism I have is that it looks like you used a lot of washes on him. I know that you did, and I don't think they look bad, but you'd probably be penalized for it in a top-level painting competition. It's most obvious to me on the inner red cape on the front. Thanks guys, I appreciate all the comments you guys give.